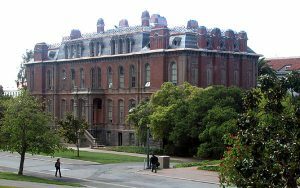 The University of California, formed from the College of California and its lands in Oakland and on the hill slopes four miles to the north, was chartered on March 23, 1868. Soon thereafter, the Regents started to appoint faculty members, and with that, began the first of several contentious issues that characterized paleontology at Berkeley throughout much of its history. J.B. Cooper, who had collected all over California including the lands to be occupied by the new university for the Geological Survey of California, wanted the faculty position in natural history. To this end, he solicited signatures, including those of Joseph Henry and Spencer Baird of the Smithsonian Institution, on a petition to the Regents requesting his appointment (Coan 1981). However, the petition arrived too late, the Regents having already appointed Joseph LeConte (left) to the position and an embittered Cooper wrote to Baird that LeConte had been elected because of the strength of the southern influence among the Regents. He added that the university was “being made into a perfect asylum for ex-rebel professors” (Coan 1981), with obvious reference to LeConte and his brother. Whether or not Cooper would have been an effective professor, LeConte surely was a very positive influence on paleontology. 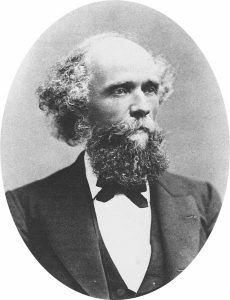 Joseph LeConte arrived at the University of California in 1869 as the first geologist, natural historian and botanist appointed to the University. In 1857 he held the Chair of Chemistry and Geology at South Carolina College in Columbia, SC (Armes 1903). During the Civil War, Columbia was burned by General T. Sherman; and life became difficult. Joseph lost all his possessions (property and slaves), but he optimistically believed that he could still succeed. When the College reopened in 1866, Joseph and his older brother John, a physicist, began teaching once again. However, the two of them became wary of the attitude of the South Carolina State Legislature toward the College, and when they heard about the newly forming University of California, they both applied for faculty positions. 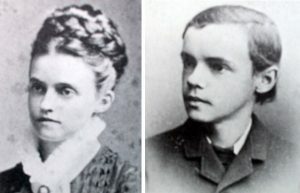 They were hired in 1868, John in November, the first of the faculty and initially acting President of the University, and Joseph in December (Armes 1903). Joseph arrived after John in September, 1869, to begin his duties. The LeContes went on to establish outstanding records as teachers and to have a large impact on the new University and science in general. 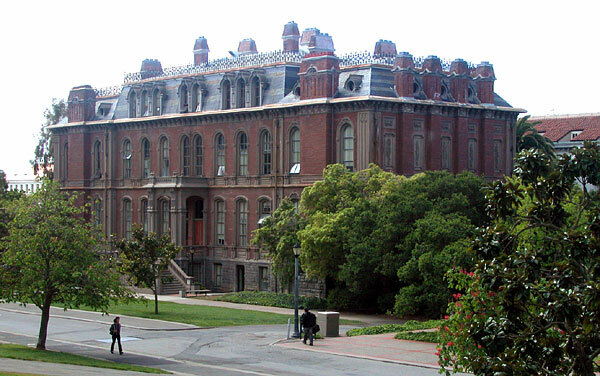 John and Joseph taught initially in buildings at the former College of California in Oakland. When the university’s first buildings on its hillside site were completed in 1873, the LeContes took up lectures in South Hall (right). For some time, they and the students commuted by horse-car to the new campus from Oakland until housing could be built in the newly developing town of Berkeley. In 1874, Joseph LeConte finally moved to Berkeley. The LeContes were highly respected and received many honors, including the naming of buildings, streets, awards, and natural formations for them. 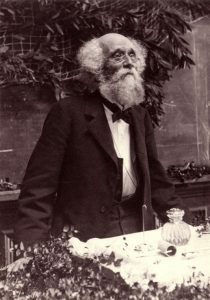 John LeConte went on to be President of the University from 1876-1881. John, not Joseph, is remembered on the modern Berkeley campus by John Lawrence LeConte Hall, dedicated in 1923 and located in the central campus area. It is appropriately occupied by the Physics Department. LeConte’s grave in Mountain View Cemetery, Oakland, CA. The headstone is a piece of granite brought from Yosemite when he died there in 1901 at age 78. Photo by Jere Lipps. The LeContes are also remembered in other ways — the north side of the Berkeley campus by LeConte Avenue; LeConte Science Magnet School in Berkeley; near UCLA where a street in Westwood was named after Joseph by Herbert Foster, a Berkeley graduate who admired him; Joseph LeConte Middle School in Hollywood, California ; Mt. LeConte in the Sierra Nevada near Lone Pine, California; LeConte Cascade on the Tuolumne River; the Joseph LeConte Memorial Lodge (Sierra Club) in Yosemite; Mt. LeConte and LeConte Lodge in the Great Smoky Mountains near Gatlinburg, Tennessee; a LeConte Club in the Mountain National Bank of Gatlinburg; by LeConte Hall at the University of Georgia and LeConte College at the University of South Carolina, named for both brothers; and by the annual LeConte Award now given by the Department of Integrative Biology at Berkeley to an outstanding undergraduate student. Joseph’s son Joseph Nesbit LeConte (left), also a Berkeley professor and Sierra Club member, has a number of features named for him. 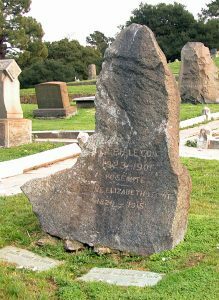 Joseph LeConte died on an outing with his daughter in his beloved Yosemite in 1901 and is buried in Mountain View Cemetery in Oakland. 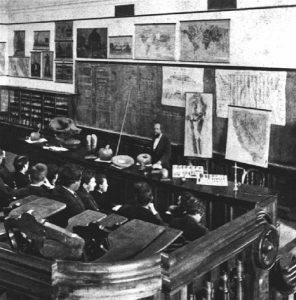 Joseph LeConte significantly influenced the development of paleontology at the University of California in three ways: he lectured and wrote not only on geology but on evolution and life of the past, he acquired still more collections of fossils for the University, and he influenced students. Indeed, the success of the paleontology program at Berkeley can be traced directly to him. LeConte was very concerned about paleontology and evolution, and he reconciled them with religion, at least in his own mind (Armes 1903; LeConte 1888b). He never did research on evolution but he became the foremost American proponent of evolution (Stephens 1982) in the late 1800’s. “…I was an evolutionist, thorough and enthusiastic. Enthusiastic, not only because it is true, and all truth is the image of God in the human reason, but also because of all the laws of nature it is by far the most religious, that is, the most in accord with religious philosophic thought. It is, indeed, glad tidings of great joy which shall be to all peoples.” (Armes 1903). He uses “enthusiastic,” most likely, in its older meaning of “inspired by God.” Although he was not a particularly religious person, he founded or helped four new churches in Berkeley. Clearly, he believed that religion was important in the lives of ordinary people, yet he emphasized that the evidence for evolution demonstrated its truth. His textbooks on geology (LeConte 1878) combined physical and historical geology with about half of each devoted to the history of Earth and life on it. Over half of the 903 illustrations in the 1878 book are of fossils, which like all illustrations in the book, he selected and supervised their renderings (Armes 1903). Some of them are reproduced from the Palaeontology volumes of the Geological Survey of California. He even had a chapter about the antiquity of humans. His smaller and briefer book (LeConte 1888a), designed for a high school students, also included much paleontology. His interest in paleontology is evident in his lecture material as well, which he used almost entirely to write his textbook (LeConte 1878). As he said, “My textbook, Elements of Geology, was simply the embodiment of my daily class lectures, but far less discursive and illustrative and therefore far less interesting than the viva voce lectures” (Armes 1903). LeConte continued to acquire yet more outstanding fossil collections for the University. He purchased a Paleozoic invertebrate collection from Robert P. Whitfield of the American Museum of Natural History, an outstanding crinoid collection made at Crawfordsville, Indiana, from Prof. A.D. Bassett of Wabash College (Lane 1963), and others. The Crawfordsville crinoid collection contained 121 “packages and pieces” including several slabs with up to 16 crinoids on them for $1000, a significant amount of money for 1883 (Van Sant and Lane 1964). Lane points out that Bassett’s salary at Wabash College was only $1500 a year, so that his fossil business must have made him quite wealthy for a college professor (Van Sant and Lane 1964). LeConte also encouraged people to donate collections to the university. The San Francisco financier F.L.A. 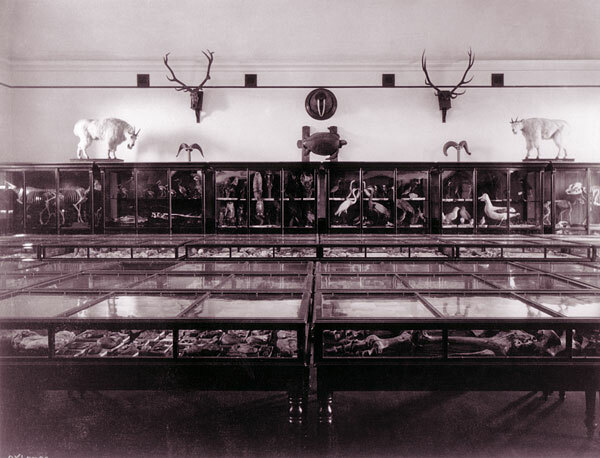 Pioche left his natural history collection of minerals, fossils and mollusks, to the university when he died in 1872 (Dalin and Fracchia 1974). The C.D. Voy collection, purchased by D.O. Mills of San Francisco and given to the University along with his own mollusk collection, was particularly important. The Voy collection of fossil plants formed the basis of Lesquereux’s report presented to Whitney as a contribution to the Geological Survey of California. These fossil plants from the auriferous gravels were not the original ones collected by the Survey, for those had been destroyed in a fire (Lesquereux 1878), but were collected by C.D. Voy from the same area that the Geological Survey of California had collected. Whitney arranged to have them published by Harvard’s Museum of Comparative Zoology as a contribution to the Survey. LeConte displayed many of the fossils he accumulated in the Museum of Natural History in South Hall (right) and as demonstrations in his courses (top left).